Here’s an interesting infographic from LearnStuff.com. We revamped our landing page, making the choice between home users and school users much clearer, as well as including our new look logo! Today we launched our new look logo on all out sites. We hope you all enjoy it! New Gigajam sales site launched! This webinar was archived from a video conference with some schools who wanted a thorough understanding of how Gigajam worked and what resources were available for learners. Tiverton High, which is a Specialist Visual Arts School, has a wonderful music team and department led by Ian Wright (Head of Music) and supported brilliantly by Joel. Ian and Joel work together to provide a flow of activities all of which are focused on providing students across all their KS3 year groups with tangible instrumental skills that enable them to access the curriculum. These skills are essential for students who wish to proceed to accreditation in KS4. The music team provide a range of activities, based around units of work, Gigajam lessons and musical futures activities that all build up and contribute to achieving the desired outcomes of the National Strategy for Music. The video attached to this blog is just one of the many activities all the students are involved in. This one is based on a unit devised by Ian and Joel to write a song called Valentine Rock. In essence it is an outcome which demonstrates the range of knowledge, understanding and skills the students have acquired through their classroom work. 1. The students develop rhythm, chords, time keeping and performance skills by working with Gigajam lessons for guitar, bass, keyboard and drums. 2. Ian and Joel take time each lesson to take groups of students to play together in a small band, whilst the other students are working with the Gigajam lessons. In a Gigajam lesson you will have students learning four different instruments at the same time, say 6 guitarists, 6 bassist, 6 drummers and the remainder learning keyboards. 3. Small bands are created and rotated so that 6 or 7 bands have a 5/10 minute band workshop with Ian each lesson, in addition to their time developing their instrumental skills. This is great for the students and the teacher as they get some quality attention from Ian and he learns about what they are doing and how they are developing. 4. The individual skills learned with Gigajam are enhanced in the second teaching area by Joel in a different unit of work as he takes groups of individual instrumentalists (say all guitarists) and provides teacher led whole class activities, focusing on the instrumental skills learned with Gigajam. 5. Over a period of time the students are building the skills that enable them to play the songs, written specifically by Gigajam, that are built with the skills the students have developed. 6. What then is really lovely, is that Ian and Joel provide them with an additional opportunity to take their skills and Gigajam songs to create their own versions by writing a song based around the components of a Gigajam song’s rhythm, style, chords, and then add their own lyrics and melody. 7. You can see that the framework of our song, The First Time (audio file) has been quite radically altered into Valentine Rock by the young ladies in the band. They captured their performance on video. The chords in the Gigajam song The First Time are Am, F, G, C.
Gigajam is about providing structured lessons that support the development of instrumental skills. Ian uses the Gigajam courses as a ‘platform’ for supporting his students when they need to learn skills to perform, compose, improvise etc. This is just one of the ways Ian and Joel create music making opportunities for their students. If you are interested in knowing a bit more Merlin John wrote an article for Futurelab on their work. Ian and Joel place a huge emphasis on knowing what their students can really do. Really understanding what skills the students possess is possible because they have created a model that gives them time with students so they can really work with them, but whilst a class lesson goes on and the other students are engaged, working and on task. Additionally, the Gigajam analyser software means that students are continually assessed, so both they and their teachers know what skills they have. Welcome to the launch of the new Xtractor X5, the award winning Gigajam practise engine for guitar, bass, keyboard and drum lessons. X5 is a major re-development from the ground up, offering you greater stability, responsiveness, and compatibility. Not to mention additional functionality. X5 has a whole new MIDI engine at it’s core. We now have an engine with which we have been able to create a fantastic practice and recording experience for our users. It also allows us to continually develop in response to our customer needs. Thanks to the new MIDI engine, connecting to instrument hardware is now easier. No longer do instruments’ MIDI clocks have to be configured every time you use them. You can also select both Input and Output devices for ultimate flexibility. X5 is compatible with more instruments, particularly those that do not allow their internal MIDI clocks to be disabled. X5 is also able to enable General MIDI mode on instruments where GM is not the default. Built upon Microsoft’s .NET 3.5 and the Windows Presentation Framework, X5 has been adorned with a fresh new interface. It’s possible for the user to toggle various parts of the interface and customise it to their needs. X5 has user configurable automatic updates. You’ll now be told when a new version is available and asked if you want to install and download it. A big challenge to developers is the constant evolution of software and hardware environments that computers operate in. X5 allows users to automatically report any unexpected errors and stay up to date, maintaining X5’s performance. Existing customers download Xtractor X5 now. As of today the DD-55 bundle has been replaced by a DD-65 bundle. Also the PSR-E403 is now replaced with the PSR-E413. The pictures on all our sites will take a little longer to change, but prices and model numbers are now updated. Mike Woods explains how the School Improvement Service for Music and ICT worked together with Music Services at Bucks County Council to create a simple model for every child in the county to have access to musical instrument tuition. Schools across Buckinghamshire are now able to offer all students the opportunity to learn a musical instrument, thanks to a project involving ICT, classroom teachers and music specialists across the county. This has been the first project of its kind in terms of creating dissemination centres and collaboration on such a large scale; utilising broadband technology as the delivery mechanism. As Buckinghamshire County Council ICT adviser, it is one of my priorities to look for ways to develop the creative use of ICT across the curriculum. When I came across Gigajam’s Essential Skills Course, I could see the potential for rolling this innovative software out across the county via BucksGfL, the Buckinghamshire Grid for Learning Broadband Network, as a cost-effective way of linking ICT with music. Also, I envisaged that students would be able to develop their ICT skills using a practical application linked to our VLE (Virtual Learning Environment), either as part of their music lessons, or as an extra curricular activity. We are a very rural authority with many small schools spread across a wide geographic area and the project also had to involve primary, secondary and special schools, so the solution I chose had to tick as many boxes as possible for all the schools. Gigajam’s software-based curriculum for the guitar, bass, keyboards and drums provides high quality educational pathways that teach musical theory as students learn how to play a modern musical instrument. To make best use of the software, students progress through the lessons using a computer and a Yamaha MIDI-enabled musical instrument. The suite of instruments chosen for the schools provides students with access to keyboards, drums, guitars and bass guitars, and consist of PSR E403s, DD-55s and two EZ-AGs, to complement the software. The user-friendly lesson instructions include ‘how to’ videos with professional musicians, audio files, backing tracks and an electronic performance assessment facility for immediate feedback. Students can select multimedia to suit their individual learning styles and the analysis software allows them to evaluate their own progress. The interactive courses are carefully structured so that students learning different instruments develop complementary skills, enabling them to play as a band from the very first lesson. Thirty schools have been given access to the full Gigajam Essential Skills Course for all four instruments together with the Yamaha musical instruments to carry out the lessons. The schools were chosen in consultation with the advisers responsible for the Buckinghamshire Music Service, not only because of their enthusiasm for the development of music within the curriculum but also because of their interest in the use of ICT. Over an initial two year period we are providing training for them and working with them to develop sustainable curriculum models suitable for each school’s needs. Five of the thirty schools were selected to take a lead role as mentor schools to become ‘music education hubs’ due to their geographic location across the county and their high level of expertise in music and ICT. Each of these mentor schools was nominated to be the hub for support and best practice guidance for five protégé schools, creating a web of support between all thirty schools. They were also tasked to provide further musical instrument opportunities for curriculum development, as well as after school and out-of-hours community projects. Access for schools to Gigajam content is through BucksGfL, the County Broadband VLE (www.bucksgfl.org.uk). Gigajam created a website specifically for the project, which was then integrated into the VLE by Atomwide, providers of technical support for BucksGfL. This means that we now have an interactive music school sitting on our Virtual Learning Environment, and our ‘single sign-on’ user authentication system makes the software available to all Bucks students who can log on to the VLE at any time and from anywhere, whether it’s from school or from home. Via the Bucks Grid for Learning, mentor and protégé schools also have access to a wide range of support resources, including the opportunity to use our Adobe ‘Connect’ video conference system to communicate with each other, as well as with Gigajam’s head office. We are also planning to provide Video Conference Master Classes, demonstrating both musical developments and the effective use of ICT. Schools within the project are already discussing joint rock band performances over the video conferencing link! 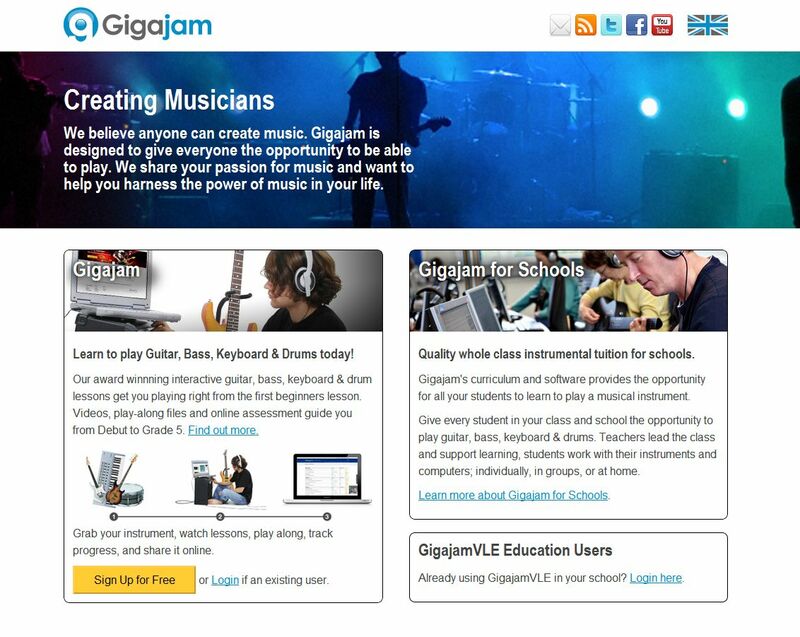 All of the other schools in the county who use the VLE have been provided with access to the first five Gigajam lessons for the guitar, bass, keyboards and drums. The Buckinghamshire Teaching and Learning Centre and Music Services Centre in Aylesbury also have full access to Gigajam content and software to enable them to support schools, and a set of loan instruments is also available to any school who would like to join in and ‘have a go’. This is a huge project in terms of its collaborative elements, and as I write we are only just over a term into the project, but we can already see benefits for pupils and schools beyond those originally envisaged. Schools across all phases and of all types are working together in imaginative ways, delivering true personalised learning to pupils. A whole year of planning has produced a sophisticated, yet simple model of delivery that gives every single child within Buckinghamshire access to music lessons in a new and exciting way. We are redeveloping our Windows version of Xtractor to address a number of legacy issues, most of which are related to the use of Macromedia Director and the SequenceXtra plugin. Here’s a sneak preview of what the new version of Xtractor “may” end up looking like. You may notice a new feature or two in this screen shot, such as the ability to upload directly to your e-portfolio.